One year into B.O.D.’s existence, Tracii Guns was left without the support of Sanctuary Records and Nikki Sixx, who was co-captain (and co-writer) of the Good Ship B.O.D. Tracii decided to continue with the group while Nikki rushe back to the Motley Crue reunion and this album is definitely hurt by the lack of Nikki’s presence (though he does hold a few co-writing credits here and there). 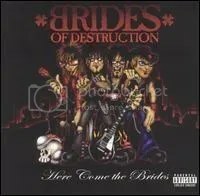 The album is much more serious, darker, and takes on a much more modern rock/metal sound than Here Come the Brides did. It just isn’t as catchy and throws out some of the 80s L.A. Strip sound the previous album had. The haunting instrumental opener “Aunt Biente” sets the mood for the rest of the album and is a good indicator and where they were heading. It’s not a bad album by any means, it just fails to live up to the potential the band showed with their debut. Again, I think Nikki leaving the band hurt this album and I really would have to liked to have seen Brides at least put on hold for whenever the next Motley down time came up. I don’t blame Nikki though because what would YOU rather do, play clubs or play arenas? In 2006, the band was put on hold when Tracii Guns (VERY temporarily) joined Quiet Riot. Since then, Tracii has gone on to form his own version of L.A. Guns to compete with the legit Phil Lewis version. Is the band done? I hope not, but I fear so. I’d like to see them continue in some form, though with the success of SIXX:AM and the revitalized Motley Crue, I highly doubt B.O.D. is of any concern to Nikki. Maybe Tracii can snap out of his current fake L.A. Guns band mindset and decide to do give us something new again and bring London along as well. The curse of B.O.D. struck again: The Wildhearts‘ Ginger had joined the band as guitarist, even co-writing a handful of songs for this album, but had left by the time recording started. 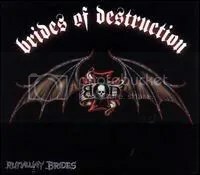 Brides of Destruction were a “supergroup”, which was put together by Nikki Sixx (while Motley Crue took one of their many breaks) and L.A. Guns’ Tracii Gun. Ex-Motley Crue singer John Corabi was recruited to play guitar and nu-metal band Adema’s Kris Kohls was to be the drummer, but both were out of the band by the time of this album’s release. I remember London LeGrand catching a lot of flack before the album was even released, with some of the more negative rock/metal sites saying he “sucked” and was a horrible singer. Just not hearing that here. The guy’s voice is fitting this music perfectly, which is a blend of 80s hard rock, punk, power pop, and modern hard rock. I love London’s performance on “I Got a Gun”. The band never took off though, even though they did manage to get an appearance on The Tonight Show. They chose “Shut the F*ck Up” as their lead single, which was a mistake because it was heavily edited for radio and received very little play. The band even chose to play that song on The Tonight Show and it sounded horrible without them being able to utter that four-letter word. I remember as soon as the album was released, Nikki was crowing about how much more material they had and that they would be releasing ANOTHER album in 2004, but it never happened. Eventually, Motley came calling again and Nikki ditched the band, though they soldiered on without him and released Runaway Brides in 2005. This album shows a lot of promise though, I don’t think there’s any filler here and I’ve often wondered what the follow-up album would’ve sounded like if Nikki had remained fully involved. “Only Get So Far” was originally written by Nikki with Faith Hill & Tim McGraw in mind, but that didn’t pan out. And if anyone still has complaints about London’s voice, they should check out that song as well.